It's been almost 250 years since Beethoven was born in 1770, and as his big two-five-oh birthday rolls around, his birthplace of Bonn is planning a big, big party—including a $90 million concert hall in which to throw it. Slated for completion in 2019—or the year before Beethoven's 250th birthday—Bonn is planning to build the Beethoven Festspielhaus, a concert hall that will "anchor these momentous anniversary celebrations and help honor and celebrate Beethoven's musical legacy." The building is being financed by the shipping giant DHL and the German government, and even though it's only five years from completion, a final design is yet to be chosen. Bonn recently announced the three finalists in a competition of international architects, and it's interesting to wonder how music played into any of them. It's pretty tough to overstate the important of Beethoven—his work led to the development of modern music, not to mention defining the canon of classical composers. The jury calls him "the most famous composer of all time." How do you build something that celebrates that through space? Check out a few shots at it below, plus a few runners-up. One of the three finalists chosen to compete for the final design is the UK-based architect David Chipperfield, who is probably best known for his trademark brand of stoic minimalism—see the exterior of his proposal for the concert hall for an example. The inside is a different story, with flowing wood paneling and sinuous curves. The Luxembourg-based architects at Valentiny Hvp also made the final cut—with a curious take on the traditional shell-like structure of outdoor amphitheaters. One runner up, the Iraq-born London-based Zaha Hadid, has been on a building spree all over the world over the past few years. It's not hard to see why Hadid's design didn't make the cut—it looks formally similar to many of her other recent cultural projects. And another runner-up: The cerebral, playful architects at UNStudio imagined a glass structure imprinted with solid shapes that weave in and out from the theater towards the facade. "The visitor experiences architecture captured in a frozen symphony," they explain. It's a shame this proposal didn't make the cut. Finally, yes, there are some German architects on this list. The Berlin-based kadawittfeldarchitektur's design for the concert hall is the third and final proposal chosen for further consideration. 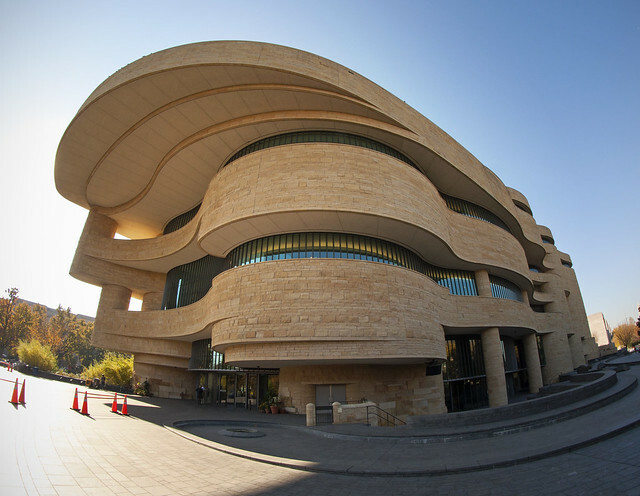 It's also the strangest: A layer-cake of striated lines stacked around a blocky central core, it looks a lot like vanilla take on the National Museum of the American Indian.